As Magic tournaments are held and results gathered, certain decks establish themselves as the top contenders, and attract attention from anyone seeking an edge. The format then shifts to combat these best decks as players “metagame” against them. This phenomenon occurs in competitive gaming scenes ranging from small-scale FNMs to Grand Prix and Pro Tours. Correctly anticipating which decks will be the hunted, and preparing accordingly, is a vital tool in any competitive player’s arsenal. This article covers the basics on how to identify when the metagame is shifting against a given deck, and the countermeasures pilots of that deck can take to evade enemy crosshairs. The most important piece of information we need for this analysis are the most recent results from major tournaments. Because of Wizards’ current policy on releasing Magic Online league data, league 5-0s are longer representative of what decks are doing well. 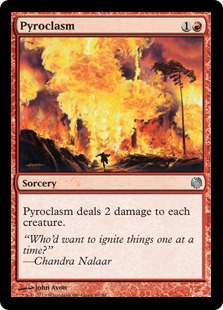 Instead, we must rely on paper tournaments such as SCG Opens, SCG Classics, and Grand Prix, along with non-curated Magic Online events such as the format challenges. While these tournaments alone are too infrequent to detect gradual metagame shifts, they provide a valuable snapshot of the decks doing well at a given point in time. Consider this summary of the archetypes that placed highly more than once between the Milwaukee SCG Open, the Milwaukee SCG Classic, Grand Prix Hartford, and the latest Modern challenge, with general descriptions in line with Jordan’s comprehensive treatise on the archetype distinction. This list paints an interesting picture. Humans is the clear top dog, followed by a variety of different archetypes, many of which rely on artifact or graveyard synergies. The clearest angle of attacking such a metagame are to operate on an axis Humans finds difficult to deal with, which typically takes the form of an attrition-based deck heavy on spot removal and targeted discard, or a fast strategy that operates on an axis Humans finds difficult to disrupt due to its lightness on mainboard removal. If these options are not feasible for your deck, gearing up to face the rest of the field by packing hosers for artifacts or graveyards is also a strong choices. Conversely, if you favor the Humans, you should prize cards such as Kataki, War’s Wage, Reclamation Sage, and Grafdigger’s Cage, as they will help you keep the synergies favored by most of the field under control. In the case of local metagames, gathering information often requires a bit more legwork than taking a peek at the latest major tournament results. Local metagames operate in relative isolation; while the metagame at large can influence some players’ deck choice, the dynamics of relative positioning won’t necessarily follow larger scenes to the letter. Some tournaments from local stores post the decklists of the top performers, which makes gathering information relatively straightforward. However, it’s more likely that you’ll have to browse the room and take notes on what you see in addition to what you face. Repeating this process over a few weeks should give you a good feeling of who the regulars are, and what decks they favor. From there, you can devise angles of attack against them, and anticipate how they’ll adjust to you. Once you have gathered the appropriate information on what you expect to face, you should take stock of your deck and what adjustments, if any, are available to you from Modern’s card pool. Let’s say you were on a decklist similar to the Hollow One deck that made Top 8 at Grand Prix Hartford. There are two major ways to attack Hollow One. One is to disrupt the graveyard in order to shut down its recursive threats (and possibly prevent its delve threats from coming down), or disrupt its ability to pressure using undercosted fatties. This can be accomplished by outright denying them their engine spells with permission, using effects such as Meddling Mage to strand them in hand, or dealing with them efficiently via bounce spells or exiling removal. Another is to pressure Hollow One with evasive attackers. Flamewake Phoenix is the deck’s only flyer, and while it does apply consistent pressure, Phoenix makes for a poor blocker thanks to its compulsive attack clause. Overall, I would say decks like Humans and Affinity do the best job at picking at Hollow One’s weaknesses, with an honorable mention going to any deck capable of accommodating a playset of Relic of Progenitus in its 75. Let’s start with the latter scenario, wherein players looking for an edge in the metagame flock to decks inherently decent against Hollow One. To fight back against a field of Reflector Mages and Vault Skirges, Hollow One pilots must identify what makes these adversaries tick, and try to answer in kind. Humans and Affinity rely on synergistic creatures to pressure opponents and close out the game, so loading up on spot removal like Fatal Push, Grim Lavamancer, and Terminate can break up attempts at disruption or buy time in the race. They are particularly weak to sweepers, so cards like Sweltering Suns or even Pyroclasm may also be a consideration. If the task at hand is fighting through specific hate cards, such as Relic of Progenitus, Rest in Peace, and Grafdigger’s Cage, the best approach is to employ counter-hate for artifacts and enchantments, the permanent types most commonly associated with graveyard hate. Hollow One’s reliance on red and black make its enchantment removal options rather limited, but given that, the deck could do a lot worse than Engineered Explosives. When it comes to artifacts, on the other hand, the options get significantly broader. Ultimately, Max opted for the powerful value of Ancient Grudge‘s flashback effect for this purpose, and I think it’s a savvy plan that only requires one green-producing shockland to be implemented. The strategies discussed above assume that the deck in question can fight back against metagaming, which is not true of every deck in the format. 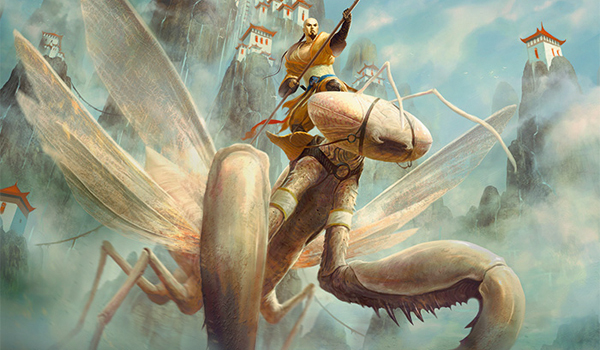 Let’s take Matt Nass’s Grand Prix-winning KCI combo list. Though it features some enchantment hate and Ghirapur Aether Grid in its sideboard, this deck is painfully vulnerable to Stony Silence and similar artifact hosers, which demand an answer if the KCI pilot is to have their deck perform as intended. Graveyard hate cards are also very effective against KCI, especially those that eliminate cards from that zone altogether. It is likely just time to move on to a new deck if hate cards that address KCI so efficiently reach a certain level of prominence. This strategy is far from uncommon for decks so invested in a linear gameplan; Affinity’s owes much of its staying power at the top of the format to its ability to squeak out wins in spite of hate, which KCI Combo has yet to replicate. When choosing a deck to switch to when your primary deck is poorly positioned, one consideration is to find a deck with a diametrically opposed matchup profile. For example, if KCI Combo is flopping at my FNM metagame, I’d be looking to jam a deck like the RG Eldrazi list that won Milwaukee’s SCG Open. This deck barely uses artifacts, is highly aggressive and creature-based, and never touches its graveyard. That means that any FNM rivals expecting Darksteel Citadel into Chromatic Sphere are in for a big surprise. Because local metagames can sometimes warp in extreme fashion to take down the current king of the hill (including the use of cards that are poor against the field but specifically good against the deck they’re trying to beat), throwing opponents this type of curveball can keep them on their toes, and make a primary deck more viable by virtue of spooking them off over-hedging for it. Extreme hate cards can also surface at higher levels in warped or fresh metagames. The Grixis Shadow wave that preceded the current metagame prompted players to pack hosers such as Chameleon Colossus and Mirran Crusader in their 75s, which they were handsomely rewarded for—Lightning Bolt also became a common tech in Grixis to counteract Crusaders. Proper metagaming, and preparation for it, sometimes means the difference between bowing out early and coming home with a prize. If you have any angles of attack you’d like to share for tackling the current winner’s metagame, or any stories on how you’ve used metagaming to gain a leg up on the competition, drop me a line in the comments.